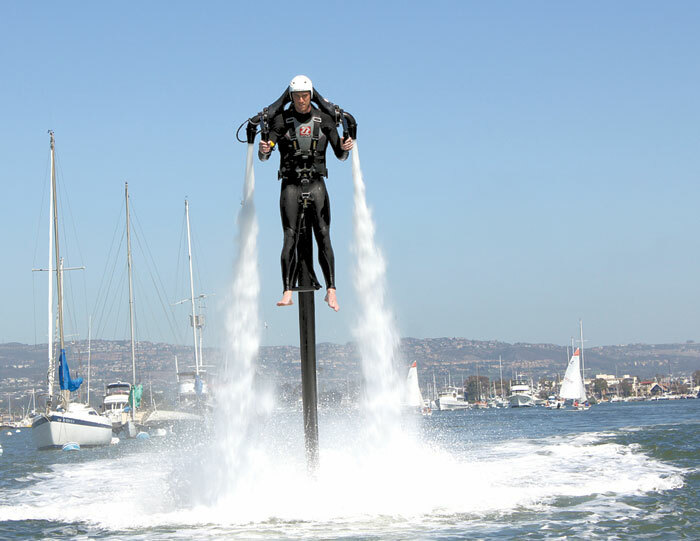 HONOLULU (AP) — Hawaii will consider possible new regulations for water-powered jet packs and boards that appear to make people fly over water, an official said July 18. People use the packs, which involve relatively new technology and are just beginning to appear in Hawaii and other states, to lift themselves up to 30 feet in the air at speeds up to 32 mph. Jet pack users strap the devices to their backs like backpacks and are elevated when a tube connected to a small boat sends pressurized water to the packs. A similar device called a flyboard can be strapped to a user’s feet like a snowboard for a similar effect. A company in Honolulu, H2O SeaBreeze, has operated jet pack tours for the past two years with a permit. Another company on the Big Island also has a commercial operation, while a third company on Maui is currently seeking a permit from the Board of Land and Natural Resources to offer a similar service. The department held a public meeting July 18 to learn more about the devices after its officers who enforce rules on the ocean and members of the public said they were concerned about the equipment being used safely and how the devices are affecting fishing and the environment. Board chairman William Aila said the department took an initial step two weeks ago toward regulation by classifying the devices as thrill craft, subjecting them to the same rules as personal watercraft. It will also consider whether additional rules are needed, he said. Bob Richmond, a University of Hawaii coral reef expert, told department officials the devices could propel fish and coral larvae through the tubes, killing the organisms. The packs and flyboards may also disrupt reefs with noise, scaring away fish, he said. People using the devices in shallow areas may also crash into the reef, he added.